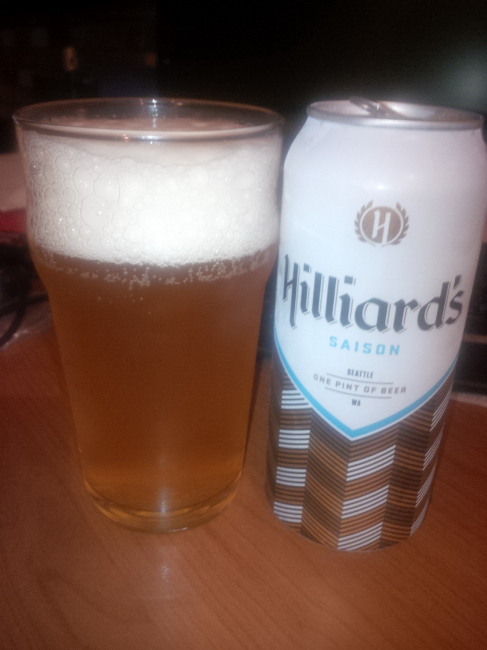 From Seattle Washington’s Hilliards Beer comes their “Saison” . The beer pours a cloudy golden colour with a white head. The aroma consists of apple, champagne, fruit, yeast and some pepper. The flavour is of apples, champagne, fruit, spices, yeast and pepper. The alcohol content comes in at 6.6% and the IBU is 20. This is a very nice Saison with a very different flavour than any other I have had. IT even comes in cans which is very different too! Commercial Description: No cork or wire cage here. We’re getting back to the spirit of a Saison as a beer you can drink every day, not just special occasions. Refreshing and complex, the high fermentation temperature used with the Belgian yeast strain allows it to add its unique characteristics to the flavor without the addition of spices. Saisons are a great style that can be appreciated by both the informed and informal beer drinker. 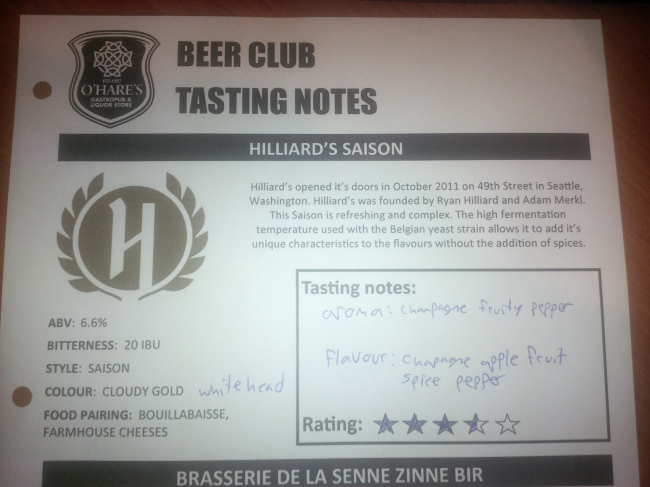 This entry was posted in Saison and tagged apples, beer, beer club, champagne, fruit, pepper, saison, seattle, spice, spices, washington, yeast, yeasty.